All are invited to the 50th annual Muir College Pumpkin Drop. 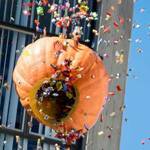 This year a 420-pound candy-filled pumpkin will be tossed from the top of Tioga Hall. Afterwards, join in a Halloween Carnival and dance.